Note from Editor - Introducing Tribute to Tinplate: Florida hobby and craft designer Howard Lamey has created many projects reminiscent of the illuminated pasteboard houses that brightened many North American households during Christmas seasons between 1928 and 1965 (often called "putz" houses from the German word for "puttering around.") This project, however, is a first step in a new direction: It's a tribute to an even older tradition - the tinplate villages and trains that surrounded so many Christmas trees in the early 1900s. Big Indoor Trains is contributing some of our own lithograph-inspired downloadable graphics for projects in this series, so look out for some big, nostalgic fun. Alert readers will note that this is not Howard's first tinplate-inspired building project - in 2008, he designed a Union Station project inspired by one of Lionel's most beloved tin stations. 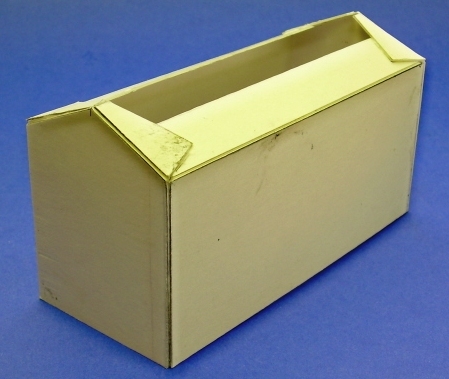 Although one could build our "Tribute to Tinplate" structures from sheet tin, we are making them from cardboard. Ironically, this reflects yet another tradition - when tinplate trains and towns were in vogue, Japanese companies manufactured heavily-shellacked cardboard houses and stations that you could use to supplement your empire. Today putz house collectors call these old Lionel and Ives-inspired cardboard houses "Lackies," because of the lacquer that made them almost as shiny as the metal structures that inspired them. 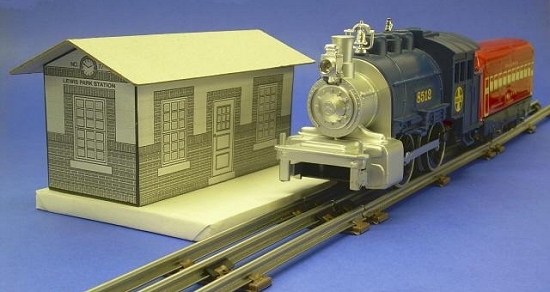 This is an easy project that was designed to look good with vintage trains. When Paul sent me the original graphic, he let me decide what size roof and platform to include, so I printed out a copy in black and white (saving my inkjet's cartridges) and made a mock-up before I began the final structure. Because this doesn't require a lot of window-frame cutting, the mockup went together pretty fast. When I went back and did the "final structure," I was more careful, but it still went together faster than most of our cardboard house projects. Clean solid cardboard, such as from cereal boxes or the backs of writing tablet. I doubled the thickness of the roof to get a more solid appearance, so you might keep that in mind. Acrylic paint for the roof and platform. Following the example of American Flyer's Hyde Park Station, I used dark green for the roof and dark gray for the station platform. If you wanted to use dark red for the roof, that would also provide a vintage look, since several similar structures had dark red roofs. Many early O-gauge and O27 trains are more like toys than models, so the "scale" of the trains and accessories are all over the map. 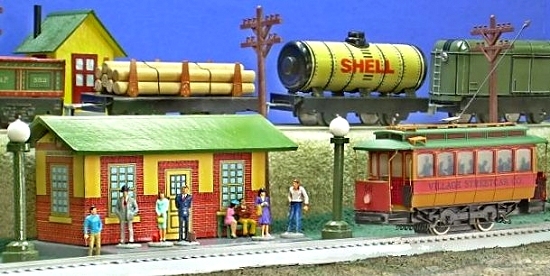 A few pieces even are closer to HO (1:87) in scale than they are to O (usually 1:48). On the other hand, some accessories made to go with O27 trains are half again as large as they should be, since they're holdovers from earlier Standard Gauge products. So if you want your tinplate-inspired projects to look right with your existing equipment, you probably want to do a "mockup" first, as I did. 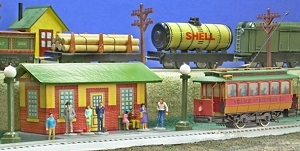 As you can see, the station looks a tad small next to a Lionel "Docksider"-style engine (which is a fairly small locomotive). However it looks plenty big next to the Marx passenger car I plan to use with it. 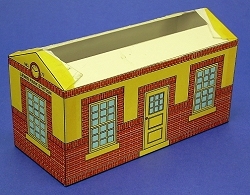 This project's appearance is based on an existing American Flyer model that was made to go with Standard gauge trains, but its size has been adapted to look good with my Marx tinplate trains. The mockup verified that. 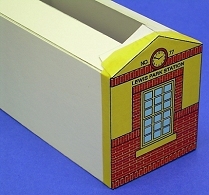 On the other hand, if you want the station to look good with the bigger Lionel O gauge trains, you might want to bump up the size a little when you print. If you want to go "way up," start with the Standard Gauge plans and shrink them as you print. 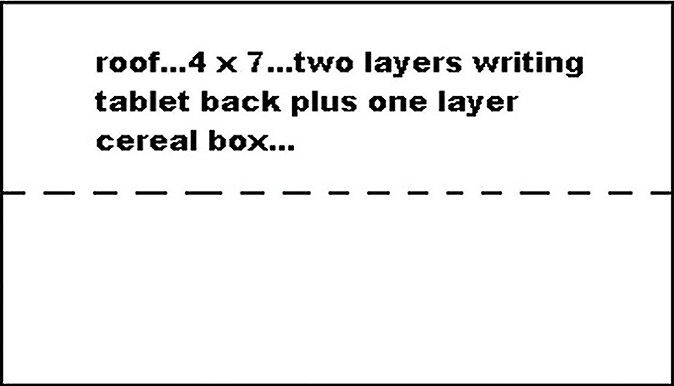 Or you may have the "chops" to manipulate the JPG version. O Scale trains or large O27 trains. The plans are printed in this scale, so if your mockup looks good with your trains, you can use the plans "as-is". Standard or Large Scale trains. These graphics are about 1.6 times the size of the "O" version, so you'll have to adjust the measurements of the plans accordingly. S Scale trains, Marx O gauge trains and holiday villages. These are about 75% the size of the "O" scale version so you'll have to adjust the measurements of the plans accordingly. Again, doing a mock-up to make certain the finished structure will look right with your existing equipment is very important. Click here to open the pdf version of the second sheet. Print as you did the first sheet. Click here to open the pdf version of the third sheet. Print as you did the first sheet. 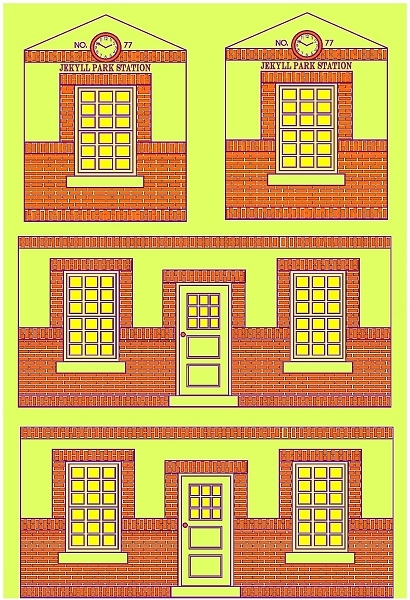 Note: If you are going to produce this building in Large Scale or S Scale, use these plans as guidelines for how the building goes together, but take your dimensions for the building walls and ends from the graphic (less 2x the width of the cardboard you are using). Printing the Graphics - We've provided several versions to help you print the plans at the size you need. We've provided the non-Halloween "lithograph" pattern for use with three different scales. For use with O scale or large O27 trains, click here to open the pdf version of the O Scale graphic. This sheet should be printed on acid-free high-grade paper or card stock. 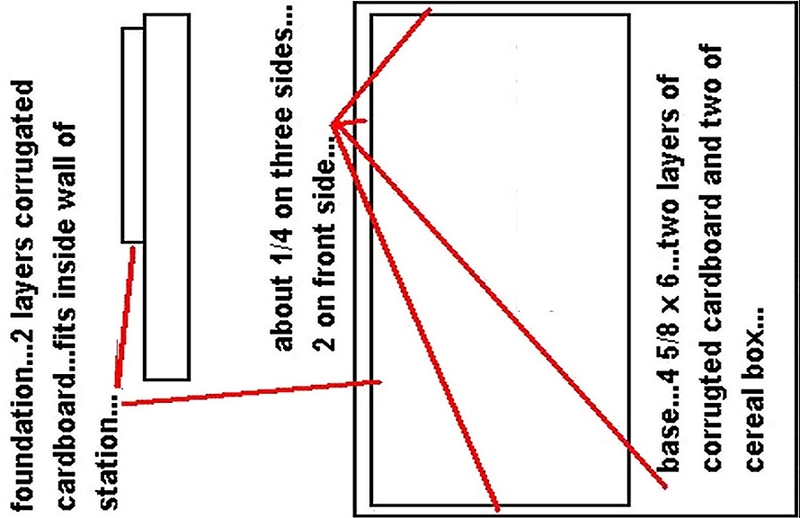 Note: Consider printing this sheet in black and white first to double-check the size against your existing equipment. For S Scale, holiday villages, or Marx tinplate trains, click here to open the pdf version of the S Scale graphic. This sheet should be printed on acid-free high-grade paper or card stock. Note: Consider printing this sheet in black and white first to double-check the size against your existing equipment. For use with Standard Gauge/Large Scale trains, print two of each of the following sheets. Note: If after you've done the mockup, you decide you need the patterns and graphic sheet to be a different size, simply adjust the % value up or down in the print setup screen the next time you print them. Printing the Halloween Graphics - We've provided several versions to help you print the plans at the size you need. We've provided Halloween "lithograph" patterns for use with two different scales. These sheet should be printed on acid-free high-grade paper or card stock. Note: Consider printing these sheets in black and white first to double-check the size against your existing equipment. A note about Copyright - However you use these plans and graphics for your personal use, please keep in mind that the lithograph graphic is copyright 2009 by Paul Race and is not to be copied, re-used, republished, or repurposed without prior permission and appropriate credit. Commercial use without prior permission is illegal and expressly forbidden. I scored the folds and glued the walls together in a rectangle. Then I cut out a piece of scrap cardboard to test the size of the roof. 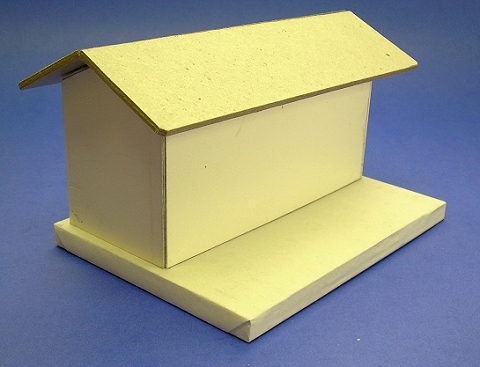 After you have built the base, cut the foundation piece out of corrugated cardboard and set it loosely on the base. Position your station over it (as shown above) to make certain it is a secure, but not overly tight fit. Once you're certain of the fit, prime the base and paint it with several coats of glossy paint in the color of your choice. Industrial gray was the color most often chosen for this kind of structure in the tinplate days. Once you are satisfied with the dimensions of the roof, build it up from layers. I used two layers of thick cardboard from the back of writing tablets, then the top surface was cereal box cardboard, chosen because it is relatively smooth and takes a crease nicely. There is no printing on the original, so I finished the roof by priming, then painting it with several colors of glossy deep green paint. Apply the printed graphics. Only do a section at a time. Measure carefully, make crisp folds, apply glue and press in place. Trim the edges of the graphic paper, if necessary. The easy part of building this structure is that you don't have to do anything with the window and door frames. The hard part is getting the corners to line up exactly. After the graphic sheets have dried in place, you will see white edges at the corner. With a black felt-tip pen, marker, or acrylic paint and a very tiny brush, carefully coat just the edge of the paper or card stock, trying not to make the printed lines any wider than they already are. Wait until the glued-on graphics are thoroughly dry, then spray the station body with spray it with several light coats of a clear glossy indoor/outdoor acrylic finish. This protects it somewhat from moisture and dust and also helps reduce fading. In addition, it makes thelithography pattern "pop." Do not such a heavy coat in one pass that you cause any streaks, runs, or drips, though, or you'll have to start over. When that is dry, glue the whole building together. I would add another coating or two of acrylic spray for good measure. However it won't soak in anywhere on the structure by now, so be careful to keep your coats light. More "Tribute to Tinplate" Articles Here's our summer, 2009 "Blockbuster," a series of projects that pay "Tribute to Tinplate," based on the tinplated-steel trains and towns of a century ago. 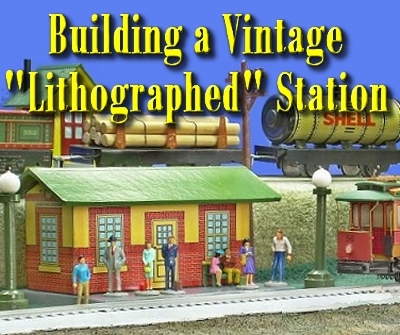 Free downloadable commercial-grade graphics and instructions will help you inexpensively add an authentic vintage look to any indoor railroad. 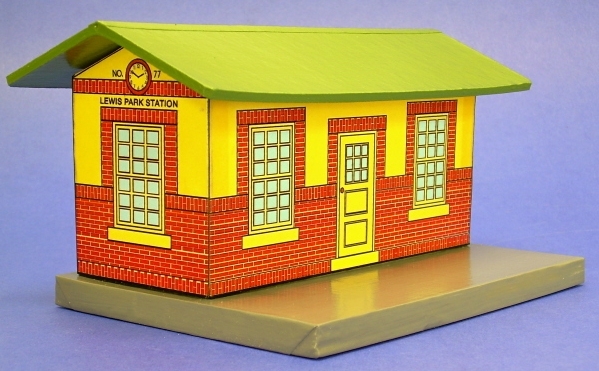 Most projects have multiple pre-scaled plans and graphics, plus scalable graphics for the smaller scales, so you can easily add a vintage look to ANY railroad or holiday village, no matter what size your trains and towns are. We have more on the drawing board, so be sure and check back. 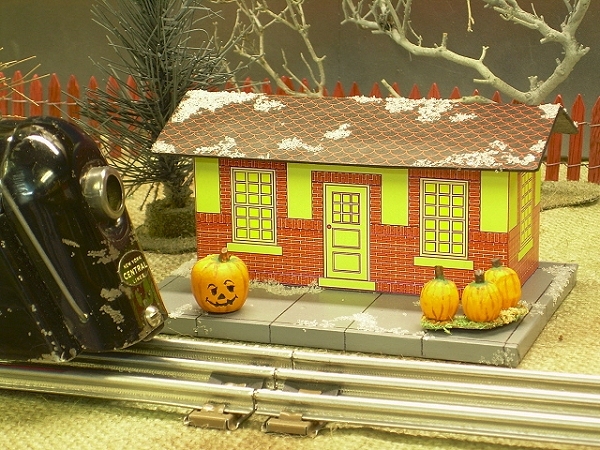 Building a Vintage Tin-Style Cottage This project is inspired by a popular pre-war tinplate house that was made to go with standard gauge trains, like the early 1900s-era Ives and Lionel. Our own commercial-quality graphics and instructions, as well as Howard Lamey's plans and assembly details are all free, to give your railroad a vintage tinplate look with a few cents' worth of materials. Many options are available, and most graphics and plans can be downloaded directly from the article. New, July, 2009! Note: Big Indoor Trains(tm), Big Train Store(tm), Family Garden Trains(tm), Big Christmas Trains(tm), Garden Train Store(tm), and Trains and Towns(tm) are trademarks of Breakthrough Communications (www.btcomm.com). All information, data, text, and illustrations on this web site are Copyright (c) 1999, 2000, 2001, 2002, 2003, 2004, 2005, 2006, 2007, 2008, 2009 by Paul D. Race. Reuse or republication without prior written permission is specifically forbidden.